Girl with MS - Tips & Tools for Thriving with Multiple Sclerosis: Healthy Gut Challenge is Here! 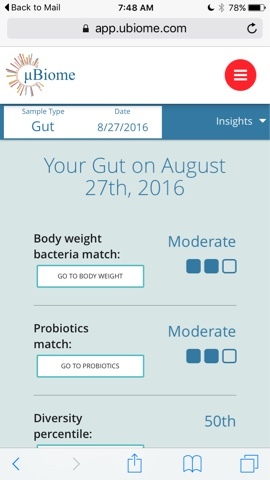 Healthy Gut Challenge is Here! I got my first results! Have you gotten yours yet? Click here to read my article on the importance of gut health and autoimmune diseases. It's time for a Challenge! The Gut Health Challenge. It's easy! 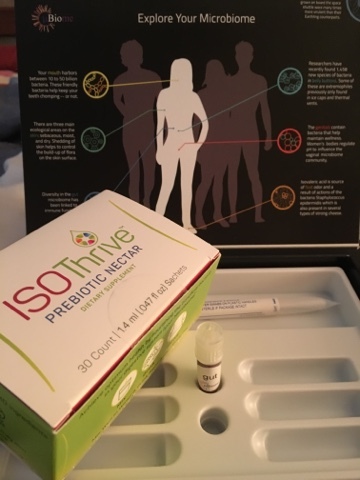 Go to isothrive.com and ubiome.com and check out the options for the challenge. Choose one and your testing kit will be mailed to you. Then swab your poop and send it to the lab in the easy to follow kit. Then start ISOThrive and test again after thirty days. Easy! Gut health is imperative for overall wellness. Click here to Check out my recent article on gut biome and how it can affect us. ISOThrive and uBiome have partnered up for a challenge. Take a look at your biome with uBiome testing kit then take ISOThrive for a month and tell us how you feel. I just started mine this weekend. I took my poop test on Saturday and hope I did it right. Then on Sunday I started my first ISOThrive sachet. Unfortunately I am dealing with a possible infection in my mouth and had to start antibiotics which I have not taken in some ten years. It is one designed just for the gums and mouth. Mouth bacteria can be bad and I don't want to mess with it so am taking the antibiotics. I tested my gut biome before starting the antibiotics. It is not ideal timing but should work out OK. I've decided to take my ISOThrive in the mornings with water prior to anything else in my system. Noticed a little extra poop today. About 2-3 hours after taking my first half sachet. 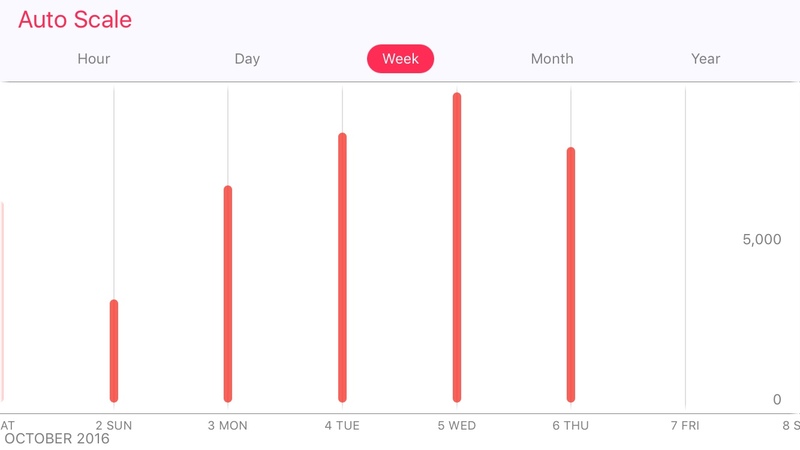 Usually it's once a day for me but ISOThrive may have contributed to a booting of something. Did not notice anything special. Except that recently I've had bad gas. Especially at night. Too much beer probably. I do love a good IPA. But no farting the last couple of nights. Sitting at airport waiting to go to Eugene. I feel great and know that my gut is working more efficiently already. Not feeling much different but believe I'm pooping more. Of course I've been eating more since I've been in Oregon absolutely pigging out and having way too much fun! It seems I poop a lot more during the day after taking ISOThrive. Interesting. Not feeling a lot of other stuff going on but that's OK with me. I just need to remember to take it. Well, maybe I'm feeling a little different. Problem is I have been eating like a horse lately and gaining a bit of weight. This often happens in the summer as it's the time of growth. We eat more and grow more in many ways. I'm curious about how my gut biome test is going to come out for the first run. It takes a couple of weeks to get it back. Also, I am curious if ISOThrive needs to be taken at the same time each day or other protocols. I prefer to take it in the morning before anything else except maybe some fresh, cool water. Haven't noticed much difference. Been feeling pretty good and it's easy to take the ISOThrive. Wahooo! just got my gut biome results from ubiome.com. This is interesting! The month has come to an end. I swabbed the toilet paper and sent off my second Ubiome gut microbiome stool sample and sent it off in the mail. I'm curious what a month of ISOThrive will do to my test results. I have noticed that my hot flashes have been significantly reduced. They just started and were horrid before beginning my ISOThrive. I am not sure there is a connection but it has been about the only change made. My diet has been full of food, good beer and wine. No holding back. I've been feeling very good. Gained a little weight but not what I should have after the calorie intake this past month. I think I did pretty well with my first gut biome test. Top 91% in health. I'll take that! But it would be nice to compare it with other people with MS. 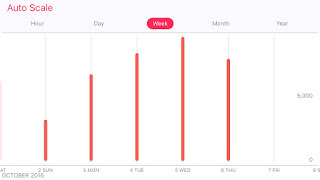 I'm curious how I will do after a month of ISOThrive. Firmicutes and Bacteroidetes are the largest phyla in the human microbiome. My gut microbiome is slightly tilted towards Bacteroidetes. Yay me! That means I have none of this good stuff to fight inflammation. I wonder if other folks with MS have the same lack of akkermansia as me. Your gut microbiome is already dominated by Bacteroidetes, which is correlated with weight loss and lower body weight. Bifidobacterium and Lactobacillus are the two genera of bacteria most commonly found in probiotic supplements. MAN - My lactobacillus is LOW. VERY LOW. Again, I wonder how this compares to other folks with MS.
Keep up the good work! Your sample contains an amount of Bifidobacterium near or above the average. Fermented vegetables that have not been subjected to manufacturing processes can provide your gut with a steady supply of probiotic bacteria. Dairy products such as certain yogurts, kefir and buttermilk contain active cultures that can increase the amount of Lactobacillus. So, with these results I decided to make some Sauerkraut and Firekraut. Also, I've been drinking lots of Siggi's probiotic drink - blueberry flavor. 50% of all Gut samples are less diverse than your sample. 50% of all Gut samples are more diverse than your sample. 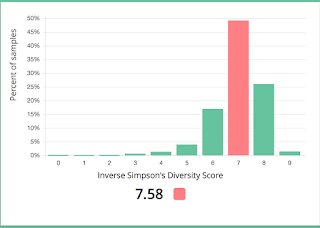 Diversity is determined using the Simpson's Diversity Index. Scores range from 0 to 10, with 10 being the most diverse. Gut samples tend to generate a score of between 6 and 9, but the distribution varies depending on the type of sample. Proton pump inhibitors, often used to treat ulcers and acid reflux, can decrease gut microbiome diversity. Well then, let's see how my next test results come out after thirty days ISOThrive. You shared good post. Keep sharing.